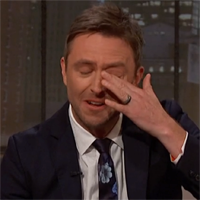 “I really just want to take a minute and I want to say that I’m so appreciative to be standing here right now, and I want to thank you, The Walking Dead community, for all your support over these past couple months," an emotional Hardwick said in his first Talking Dead episode since ex-girlfriend Chloe Dykstra accused him of emotional and sexual abuse. "This show is not just a job to me, this is a vital part of my life, this has been a sanctuary these last seven years we’ve been here." Hardwick also said "I have so much gratitude to you the fans, the producers, and the casts of these amazing shows for allowing me to be a part of this community every week." Hardwick didn't mention that one of the producers, co-executive producer Jen Patton, and other Talking Dead staffers quit in protest over his reinstatement. “They felt they couldn’t stay after Chloe was not part of the investigation,” an insider told Deadline. AMC had no comment on the departures.